In 2016, I wrote an article called “The Stripes Tell a Story…but Not the Whole Story.” The basic premise was that, on any service member’s uniform, there are stripes and insignia that mean a whole lot, but they’re not the whole story. On the Army Dress Uniform, there are stripes on the sleeve that indicate six month periods in which a veteran served in a combat zone. These “combat stripes” tell a story of the veteran’s service, but the symbolic space between the stripes,those months that a service member spent between deployments,is just as impactful as the stripes themselves. 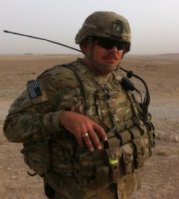 Although I was not deployed to combat in 2008, I was sent to a Temporary Duty Station for ninety days, as well as at least another sixty days in field training, preparing for my next deployment in 2009. There was not a year between 2006 and 2014, the year I retired, that I spent a full year at home. The space between my deployments was filled with training, preparation, and more training, taking me away from my family. Many if not all military spouses can relate. As I was talking to someone about this article, it dawned on me. My family experienced my combat stripes, along with the stripes that indicated my rank, my service, and any other combination of stripes on my uniform, in a totally different way than I did. This is thinking about the other side of the stripes. The other side of the stripes are filled with support, especially for me, and for what I was doing. My wife cared about things because I cared about them, and agonized with me over some of my challenges with soldiers. She became an expert organizer, military packer, and problem solver. She knew where I left stuff before I did, and always patiently steered me in the right direction. The spouses that live on the other side of the stripes can make us complete. In many ways, my wife humanized me in a way that I didn’t humanize myself, when it came to my troops. When we first got together, and a couple of my soldiers called my house phone, she answered. They hesitated, then asked for me.s she came to get me, she heard one of them say to another, “Sergeant France has a woman.” I’d like to think that this was because they couldn’t envision me as having a life outside the Army, just as it’s weird to see your high school teacher at the grocery store. But, she was very much a grounding factor in my life, someone that brought me joy apart from the military. She was also a calming influence on me…sometimes. She would tell me when I was being pretty harsh with someone on the phone, or in person, and for a long time was the only one who had the ability to do that. I know that for many spouses, they are a stabilizing factor in their service member’s life. Living on the other side of the stripes means that, often, there is the ability to be the one that helps steer the car back on the road, to let the service member know that they are starting to drift a bit too far. For me, my wife experiencing the other side of the stripes represented certainty. I trusted her, and I was sure that she would support me in whatever I was doing. She believed in me, and that trust enabled me to be a more effective leader for my troops. What Else is on the Other Side of the Stripes? Unfortunately, the other side of the stripes came with some neglect on my part and sacrifice on her part. There were times that her sleep would be interrupted by middle-of-the-night phone calls, or spending way too long at the motor pool. She still sacrifices, even after I retired, because of my work in the veteran mental health field. There were times when I put the Army, or my troops, ahead of her. A great example was when I got promoted to Sergeant First Class (E-7). I was on Recruiting Duty outside of Fort Meade, Maryland, and like all Recruiters, I had a high school l that I was responsible for. My assigned school had an Army JROTC program, so I, in my infinite wisdom, decided to turn my promotion ceremony into a recruiting event! I made sure it was scheduled at a time that was better for the kids in the JROTC program, and invited them to be a part of my promotion ceremony, to show them what they, too, could get in the Army! My Battalion Commander and Command Sergeant Major attended, and even our Brigade Chaplain and his wife were in attendance. While it could have been a day all about me, and the support of my wife, I made it about the Army. Who can relate? For many spouses, the other side of the stripes is complicated, frustrating, and wonderful all at the same time. Perhaps you can relate. How have you experienced it, and what lessons have you learned from it? We’d love to hear your feedback in the comments below. I’ve lived on the other side of the stripes. It wasn’t easy. It still isn’t easy. Military service changes you…all of you…the whole family. And even though our children weren’t born until after he was medically discharged they are still impacted by how we were both changed.. It is encouraging to read your article and to feel seen and valued. I too work in the veteran mental health field, and I dare say that my time with vets is as healing for me as it is for them. Tara, thank you so much for your openness and your feedback! You’re absolutely correct, military service impacts the entire family. 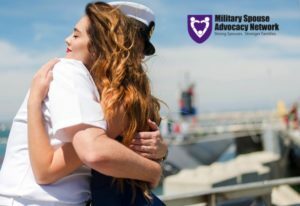 Glad to hear that you’re serving others while also being served yourself…that’s the kind of genuine therapeutic relationship that our service members and their families need!